The gates are wide open at Maple Street Community Garden — saved from fraudulent “owners” and on its way to becoming a city-owned, permanent public space! Green Valley Farm got a new hydroponics system this year! This 20-year-old community farm and farmer’s market space was nearly sold to a private developer for $1 this year. Instead, thanks to our collective advocacy, this vital community institution is surviving and continuing to serve the neighborhood! In an ex-vacant lot in Flatbush, today there’s thriving green infrastructure for the community. In the last year, Q Gardens’ volunteer-run community composting program has taken in over 9 tons of neighbors’ food scraps and turned it into high-quality compost! Neighbors are collaborating with city agencies and other non-profits to create a new pop-up community garden in Staten Island on land owned by the NYPD! 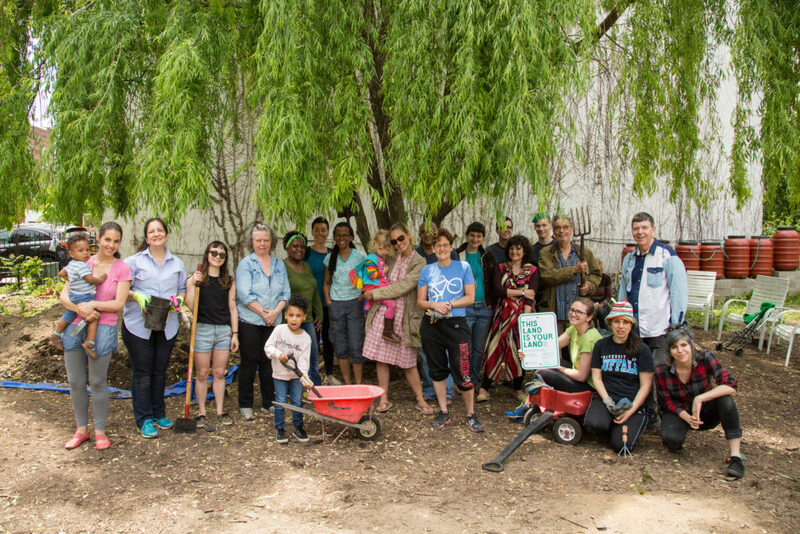 1,943 organizers signed up in 2017 on our web tool LivingLotsNYC – that’s 1,943 instances of folks looking to work with their neighbors to create community resources out of vacant land. NYC has its first citywide COMMUNITY LAND TRUST and we are ready to help communities organize for more! This year, together, we helped save nearly 400 community spaces from the City’s tax lien sale. After decades of neighborhood advocacy, the city has committed to making the Stanton St. building in Sara D. Roosevelt Park useful for the public! At least 5 community gardens are ready to gain permanent protection any day now via transfer to the Parks Department! Local organizers in Far Rockaway succeeded in convincing the city not to sell a long abandoned city-owned lot, and to make it a public park instead! Lawmakers are taking seriously the legacy of Urban Renewal — and listening to our collective calls for accountability. Please donate today and help communities keep winning in 2018! Click here to donate.